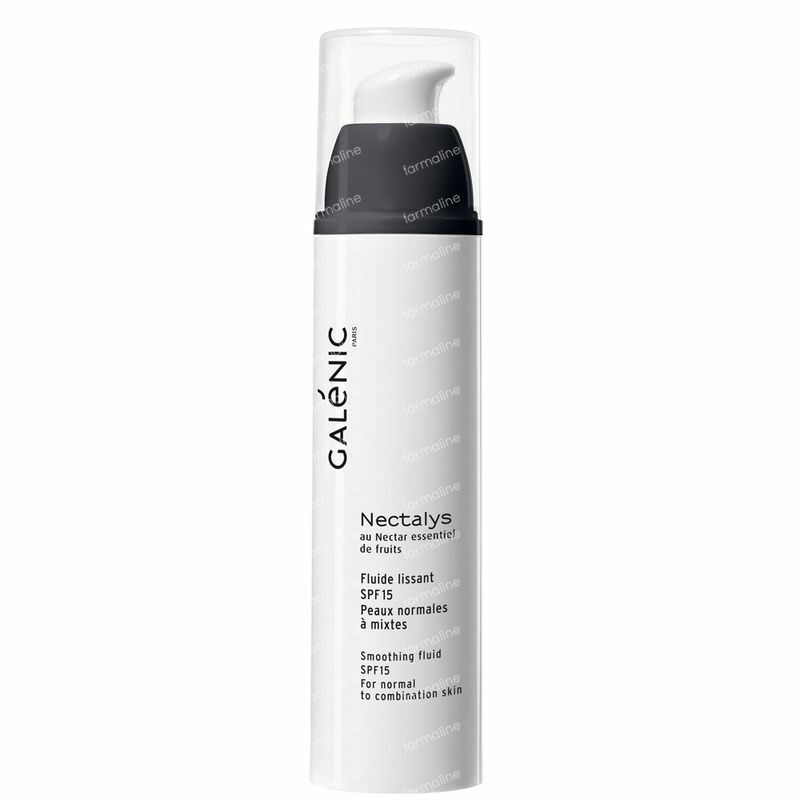 Galénic Nectalys Smoothing Fluid SPF15 50 ml order online. Galénic Nectalys Smoothing Fluid SPF15 is a light and melting textured moisturiser that smoothes our wrinkles, protects the skin with its broad spectrum sunscreen and reveals the natural radiance of the skin with the antioxidant rich fruit nectar complex. The fluid will leave your skin glowing all day long. - The essential nectar derived from peaches, figs and mandarin is high in vitamin C, delivery a potent dosage of skin rejuvinating and line smoothing action. Stimulating polyglucides and magnesium help to fight fatigue and perk up the skin mere moments after applying it. An antioxidant rich fatigue fighting moisturizing fluid SPF15, for a radiant complexion. Suitable for normal to combination skins. Apply the fluid daily onto cleansed skin of after the nectalys serum application, for even more antoxidant rich protection and rejuvination of the skin. WATER (AQUA), ETHYLHEXYL METHOXYCINNAMATE, CYCLOMETHICONE, OCTOCRYLENE, SD ALCOHOL 39-C (ALCOHOL DENAT), PEG-8, BIS-ETHYLHEXYLOXYPHENOL METHOXYPHENYL TRIAZINE, ISODECYL NEOPENTANOATE, PENTAERYTHRITYL, ETRACAPRYLATE/TETRACAPRATE, CETEARYL ALCOHOL, COCO-GLUCOSIDE, POLYMETHYL METHACRYLATE, BHT, BUTYLPARABEN, CHLORPHENESIN, CITRUS NOBILIS (MANDARIN ORANGE) FRUIT JUICE (CITRUS NOBILIS FRUIT JUICE), DIMETHICONE CROSSPOLYMER, DISODIUM EDTA, ETHYLPARABEN, FICUS CARICA (FIG) FRUIT EXTRACT (FICUS CARICA FRUIT EXTRACT), FLAVOR (AROMA), FRAGRANCE (PARFUM), GERANIOL, HEXYL CINNAMAL, HYDROXYETHYL ACRYLATE/SODIUM ACRYLOYLDIMETHYL TAURATE COPOLYMER, LECITHIN, LIMONENE, LINALOOL, MALTODEXTRIN, METHYLPARABEN, ORYZA SATIVA (RICE) POWDER (ORYZA SATIVA POWDER), PHENOXYETHANOL, POLYSORBATE 60, PPG-12/SMDI COPOLYMER, PROPYLPARABEN, PRUNUS PERSICA (PEACH) JUICE (PRUNUS PERSICA JUICE), RED 40 (CI 16035), SODIUM HYDROXIDE, SORBITAN ISOSTEARATE, SQUALANE, TOCOPHERYL ACETATE, XANTHAN GUM, YELLOW 6.